An elemental explosion for 20 points of fire damage, 20 points of shock damage, and half as much damage to stamina. 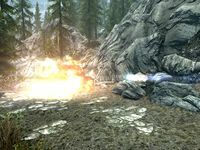 Elemental Bolt is an apprentice level Destruction spell that deals fire/frost and shock damage, with half as much fire/frost damage being dealt to stamina and half as much shock damage being dealt to magicka, over an area, upon projectile impact. The projectile deals fire/frost and stamina damage, and burns targets, dealing 20% of the immediate fire/frost damage and half as much stamina damage over 2 seconds. While the resulting explosion deals shock and magicka damage over 1 second. Elemental Flare, deals 20 points of fire/frost damage and 10 points of stamina damage in 15 feet; targets receive a burning effect that lingers, dealing an additional 4 fire/frost damage and 2 stamina damage for 2 seconds. Shock (FExxx860; ccBGSSSE014_HazardShockSpell01), deals 15 points of shock damage and 7.5 points of magicka damage for 1 second. Shock damage explosion enchantment (FExxx83F; ccBGSSSE014_EnchShockDamageExplosion01), deals 16 points of shock damage and 8 points of magicka damage for 1 second. Deep Freeze Paralyze, paralyzes targets for 3 seconds; if the Deep Freeze perk has been unlocked. Disintegrate, deals 200 points of shock damage for 1 second; if the Disintegrate perk has been unlocked. Intense Flames Rout, demoralizes targets up to level 99 in 15 feet for 15 seconds; if the Intense Flames perk has been unlocked. Perk Impact Stagger, staggers targets for 0.25 points, upon dual-casting; if the Impact perk has been unlocked. Apprentice Destruction, reduces the spell cost by 50%. Aspect of Terror, raises the level that targets can be demoralized to level 109; if both the Aspect of Terror and Intense Flames perks have been unlocked. Augmented Flames (Rank I), raises the damage dealt by the Elemental Flare effect to 25 points of fire/frost damage and 12.5 points of stamina damage, with 5 points of fire/frost damage and 2.5 points of stamina damage being dealt as additional damage for 2 seconds. Augmented Flames (Rank II), raises the damage dealt by the Elemental Flare effect to 30 points of fire/frost damage and 15 points of stamina damage, with 6 points of fire/frost damage and 3 points of stamina damage being dealt as additional damage for 2 seconds. Augmented Frost (Rank I), raises the damage dealt by the Elemental Flare effect to 25 points of fire/frost damage and 12.5 points of stamina damage, with 5 points of fire/frost damage and 2.5 points of stamina damage being dealt as additional damage for 2 seconds. Augmented Frost (Rank II), raises the damage dealt by the Elemental Flare effect to 30 points of fire/frost damage and 15 points of stamina damage, with 6 points of fire/frost damage and 3 points of stamina damage being dealt as additional damage for 2 seconds. Augmented Shock (Rank I), raises the damage dealt by the Elemental Flare effect to 25 points of fire/frost damage and 12.5 points of stamina damage, with 5 points of fire/frost damage and 2.5 points of stamina damage being dealt as additional damage for 2 seconds. This perk also raises the damage dealt by the Shock hazard to 18.75 points of shock damage and 9.375 points of magicka damage for 1 second. Moreover, it raises the damage dealt by the shock damage explosion enchantment to 20 points of shock damage and 10 points of magicka damage for 1 second. In addition, this perk raises the damage dealt by Disintegrate to 250 points of shock damage for 1 second; if the Disintegrate perk has been unlocked. Augmented Shock (Rank II), raises the damage dealt by the Elemental Flare effect to 30 points of fire/frost damage and 15 points of stamina damage, with 6 points of fire/frost damage and 3 points of stamina damage being dealt as additional damage for 2 seconds. This perk also raises the damage dealt by the Shock hazard to 22.5 points of shock damage and 11.25 points of magicka damage for 1 second. Moreover, it raises the damage dealt by the shock damage explosion enchantment to 24 points of shock damage and 12 points of magicka damage for 1 second. In addition, this perk raises the damage dealt by Disintegrate to 300 points of shock damage for 1 second; if the Disintegrate perk has been unlocked. Destruction Dual Casting, increases the spell effectiveness by 2.2x and increases the spell cost by 2.8x; if dual-casted. This raises the damage dealt by the Elemental Flare effect to 44 points of fire/frost damage and 22 points of stamina damage, with 8.8 points of fire/frost damage and 4.4 points of stamina damage being dealt as additional damage for 2 seconds. Elemental Bolt will damage both friend or foe in its area of effect, although, it will not damage the caster. With this in mind, take care when using the spell in the company of followers who tend to fight at close range, as even protected NPCs can be killed in this manner. For Deep Freeze Paralyze, Disintegrate, and Perk Impact Stagger to take effect, the spell projectile must hit the target, not just the explosion alone. It is sometimes recommended to aim at a target's feet, instead of their body, so that dealing damage from the explosion effect is almost guaranteed. This also avoids the situation of missing a direct hit and dealing no damage whatsoever. Like most Destruction spells, it can be used to detonate runes or oil slicks from a safe distance. Also, casting the spell, or merely having it ready to cast in an area with flammable gas will result in the ignition of the gas and a subsequent explosion. The spell projectile possesses qualities of the three elements; fire, frost, and shock.